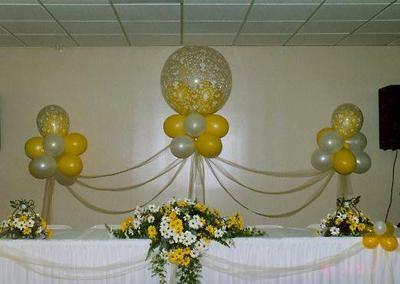 Can I use Non-Helium Ballons to make a Centerpiece? I need to send balloons out of the United States for a sweet 16 celebration in another country where they don't have access to helium... What kind of balloons will I need to buy, that will make a nice centerpiece similar to the one that I'm uploading? You can create "balloon clouds" (as the balloon decoration in your image is called) with non-helium filled balloons. Instead of anchoring the floating, helium-filled version to a base on the floor, you'd have to hang the air-filled balloon clusters from the ceiling. A nice alternative would be to make so-called mini balloon topiary trees. You can either use flower pots as base, as explained in this article by Signature Balloons, or you would use a smaller version of our balloon column base and decorate both top and bottom of the topiary tree with balloons.